RALEIGH -- Many items in North Carolina's nearly 1,000 cultural and historical repositories are at risk as a result of normal deterioration, environmental damage, negligence or improper handling. The State Archives of North Carolina can help through its Traveling Archivist Program (TAP). The TAP encourages best practices in collection preservation and access by providing onsite, hands-on assistance to institutions that preserve North Carolina's history and culture. The program provides a collections assessment, recommendations for managing and caring for the collections and staff training. Historical and genealogical societies, libraries, archives, museums and historic houses can all benefit from the help that this program offers. Organizations must apply by March 1 to get assistance through TAP. All North Carolina cultural and heritage institutions that house and maintain active archive and record collections accessible to the public are invited to apply. Institutions that only house objects or artifacts are ineligible for this program. The application and instructions are now available online at the State Archives website at http://www.archives.ncdcr.gov.the/. 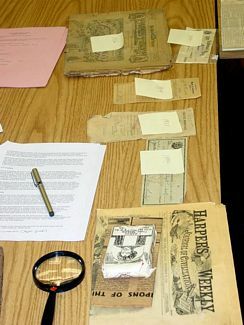 The State Archives of North Carolina collects, preserves and makes available for public use historical and evidential materials relating to North Carolina. Its holdings consist of official records of state, county and local governmental units, copies of federal and foreign government materials and private collections. For more information call the State Archives at (919) 807-7326. The State Archives is a division of the Office of Archives and History of the N.C. Department of Cultural Resources. The N.C. Department of Cultural Resources annually serves more than 19 million people through its 27 historic sites, seven history museums, two art museums, the nation's first state-supported Symphony Orchestra, the State Library, the N.C. Arts Council, and the State Archives. Cultural Resources champions North Carolina's creative industry, which employs nearly 300,000 North Carolinians and contributes more than $41 billion to the state's economy.